Software libraries are files containing a set of functions that can be added to any program. These functions can then be used just like other functions of the program itself. Software libraries come in files with ".lib" extension. They are added to a program by including them into Additional libraries section of Compiler settings (in Ansteron IDE, go to menu Build then select Compiler settings). Functions of a library are nothing different than functions of the program. They are actually just a way to re-use the works that had been done across different programs. The process for making a library is the same as making a program. In fact, any program can be turned into a library and all of its function can be recycled, except the "main" function. When Ansteron IDE compiles a program, it will automatically exclude unused functions to save memory. However, static data (text), global variables and interrupt functions of the library are not excluded even if they won't be used. Therefore, the program should only include the libraries that it will need. Some library may use functions from other libraries as well. In that case, the subsequence libraries must also be included into the program. Any program created in Ansteron IDE has two output options. It can be compiled into an executable binary to be downloaded onto Ansteron Board or it can be compiled into a library. When a program is compiled into library, its "main" function is excluded. The library files contains linkable information, compiled binary code, static data (such as text) and preprocessor definitions. Source of the library is not included. To compile a program as library, open Compiler settings dialog then check Generate library option. Since the main function won't be included in a library, it can be used for debugging the library while being built. A regular program can be turn into a library just by switching the compiler option as mentioned above. However, unused text and global variables should be removed in both cases. The same process can be applied to any register. It is important that library should only change the bits that are needed and leave other ones the same. 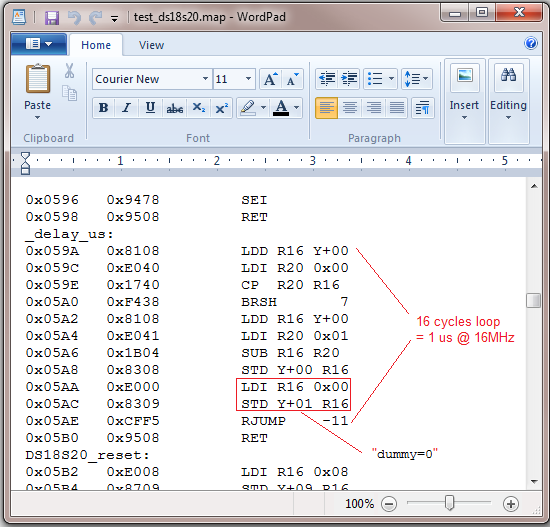 A complete list of registers, their name and functions of each one are described in CPU datasheet. 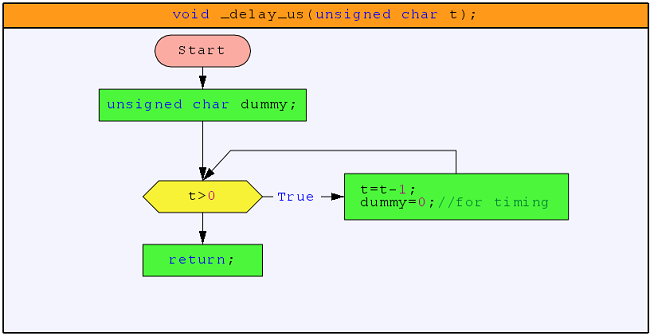 Interrupts can be used to create a so called "background task" which can run without the attention of main program. The library can utilize interrupts from different peripherals to handle data transfer, protocol or automatic tasks and provide easy to use interface for users. Full description about handling interrupts is described in another article (link). Data buffers can be created as an array of variables. They can be accessed using an index as well as a pointer pointing to that buffer. These two can be used to handle strings and data transfers. Attention should be made when using pointers since accidently write to memory space that contain registers may cause the CPU to have unexpected behaviors. These errors may not be detected when debugging. They are functions for controlling special features of the CPU and all of them start with the prefix "system_". Functions such as "system_disable_interrupts();", "system_enable_interrupts();",... are equivalent to CPU instructions CLI, SEI. The library can also provide call back feature with system_indirect_call_function(); or accessing data attachment on program memory with system_read_program_memory();. Description of all system functions can be found in standard library (link). Preprocessor provides a simple way to define constants as identifiers. These identifiers can be used as options for a functions or settings instead of giving a number explicitly. Identifiers can be defined in Preprocessor tab or adding a preprocessor script file (.pre) into Additional libraries section of Compiler Setting. All definitions in Preprocessor tab will be carried with the library and the ones from preprocessor script files will not. Preprocessor script files are similar to text files but with ".pre" extension. Serial interface can be very useful when debugging the library. Serial functions from Standard library can be used and then removed when the library is complete. Serial Terminal of Ansteron IDE is simple to use, it will also automatically disconnect when a program is going to download and reconnect by itself. Note that it takes a second for the Serial Terminal to re-establish the connection. Some data may not be captured if Ansteron Board starts sending data immediately after reset. Standard library will always be there, libraries can always rely on it. It does not have any static data or global variables so it costs nothing to a program to include the library. I/O pins constants (PIN_Bx, PIN_Cx, PIN_Dx) that are defined by standard library can be used for different functions as well as libraries. These constants are 16 bit integers with high byte is the base address of the pin and low byte is the mask. This will take more time and memory than directly access. However, it's fast enough and easier to use. See source file of Standard library for example. All timers should run at maximum clock for all purpose. The reason is to keep PWM outputs at highest quality possible. If interrupts from timers are used and lower rate is needed, a software-based prescaler can be implemented instead of reducing timer clock.